She showed up in the spring. I noticed her spinning her translucent masterpiece outside my laundry-room window. I paused from my folding to watch her work, the beautiful yellow zig-zag on her back, bright against the black as her meticulous handiwork came together. Phoebe had just completed 15 months of high-dose chemotherapy, preceded by brain surgery and recovery. Finally our girl was home. We were a family again and life was full of possibility. We set to work on our garden; building the fence, prepping the soil, pulling weeds. Phoebe sat in her little camping chair and held the spade and kept me company, her little green sun-hat shielding that sweet bald head from the hot sun. The farm was abuzz with activity. Beloved friends came to offer their help as we built a chicken coop and put up fencing and tilled the soil. Sweet fellowship over dirt and seed and shared work. We were brimming with hope, intoxicated by the mundane. Life was moving forward and I can still hear her shout “No more chemo!” with joy. These were blessed days. A meticulous handiwork underway. I watched the spider through the spring. Each time I turned the garden hose on, I looked at her up close. By now her beautiful web was complete and full of unlucky flies who’d fallen for her trap. She was so big and magnificent it was hard to miss her in my small window in each day. She just made me happy and her arrival signaled the beginning of my own personal spring. A time to build. As the days became more vibrant, the garden followed suit. Squash amidst towering sunflowers, tangles of tomatoes intertwined with Zinnias, zucchini vines covered the ground and okra sprang up tall and pointy. We feasted. On life, just the living of it, and on sustenance from the work of our hands. The kids would run to the garden empty handed and return with their proud bounty. Phoebe loved that squash and the tiny tomato varieties and Deacon was my weeding buddy. These days were precious and we understood what it meant to be thankful way down deep, for each moment. On some afternoons I would show Phoebe the spider. I would lift her to the window so she could see up close. 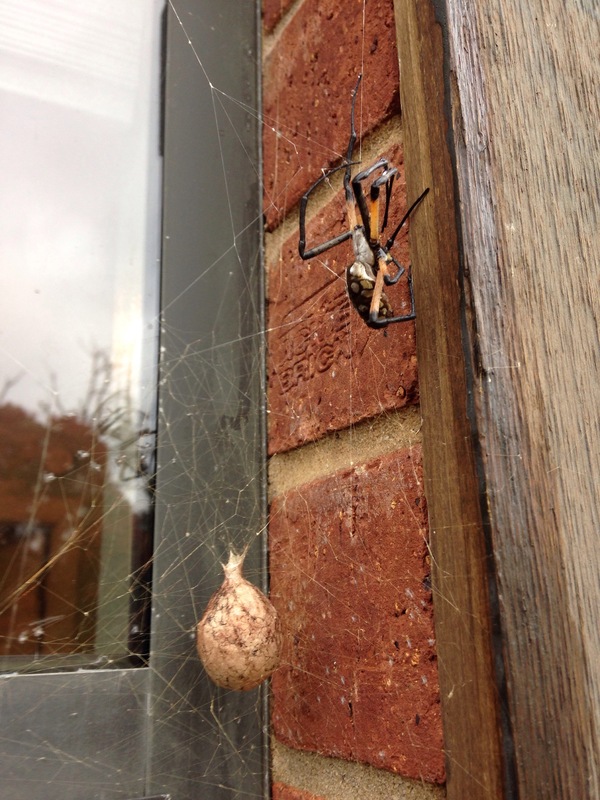 We all loved that this creature had made her home in our window, and now she was creating egg-sacks to hold her babies. We watched as she so carefully twirled the gauzy balls of web with her graceful legs as she worked. 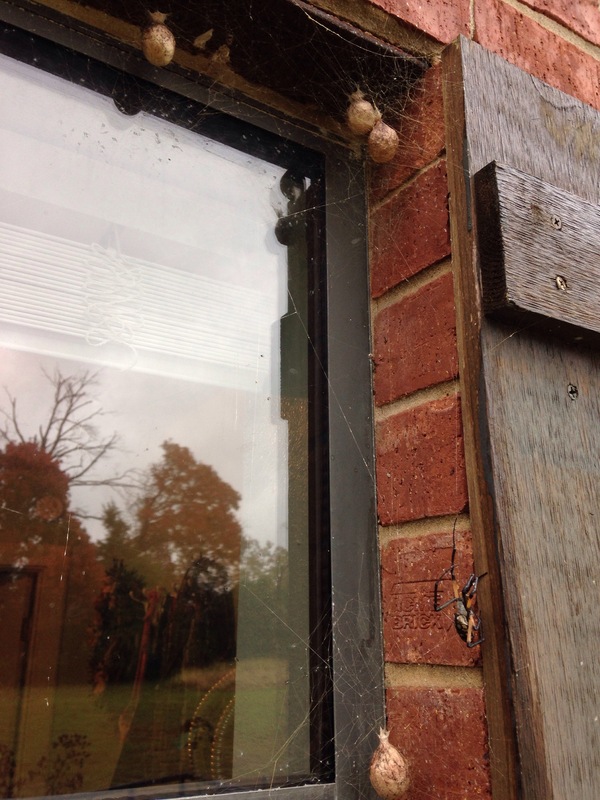 Before too long, there were several egg sacks tucked safely around the edges of the window. Spring gave way to the dog days of summer and in July our hope was crushed. The tumor was back. And two to eight weeks. Soon the garden had given it’s best and the vegetables became less. We lacked motivation now to go on and so it went to seed. I half expected the spider to die, as if somehow our devastating news would have an impact on everything around us. I found myself surprised that the world could go on, but it did, and does. And then she was gone. My Phoebe. The days were a blur and the funeral and the activity and all the busy-ness. Until at last, we were alone, the five of us, without her. And the spider was still there. And how could this little spider still be here against the elements and my Phoebe not? But she made me happy still, because Phoebe had marveled at her. We had enjoyed her together and watched her weave her beautiful egg sacks in preparation for the future. This morning I went to start the laundry. It’s been cold, really cold, and rainy. And I saw her. Not the striking star shape she usually positions herself as, but crumpled. I am sad to see her gone. But it seems fitting. She had a beautiful spring, she worked hard, she displayed the magnificence of her Creator. She reminds me of Phoebe like that. I will keep watch on those egg sacks, and maybe this spring one of those little spiders will take up residence in my window. I think I was eleven; sixth grade, Mr. Maloney’s class, the first time I fell in love with a paragraph. I don’t recall the story we were reading silently at our desks, but I do remember the lemon-lime candy the author described in such exquisite detail that it made me drool on my shirt. All I could think about for the rest of the school day was this piece of lemon-lime candy the girl in the story was savoring. I had never even tasted lemon-lime candy, but I knew I had to find it. Now. The power of the imagery and description in that paragraph stayed with me until at last I found a lemon-lime candy of my own. Silly, yes, but the fact that four little sentences had impacted me so, made me take notice of the written word in a new way. It’s my mother’s fault. I blame her for my ridiculous appetite for books. When I was nine she and I took turns reading “The Secret Garden” at bedtime. Each night I would hurry through my bedtime routine so we could have more time to read. I was enchanted by the mystery of the garden, the waif-like and crippled Colin Craven, stubborn Mary Lennox, and Dickon Sowerby who could talk to animals. The Narnia series soon followed and scores of other books I bought from the Scholastic catalog. Oh happy day when that shiny catalog showed up on my desk at school. I still swoon at the memory. As a teenager, poetry became paramount as I devoured the works of Poe, e.e.Cummings and Rainer Maria Rilke. I filled journals with poetry; Haiku, prose, line poems, Diamante. I pontificated on topics like the Holocaust, religion, love, death, and of course teenage angst. I hashed it all out with words and gave it all to Jesus when I was 21. Fifteen notebooks full of ink are smashed into boxes up in my closet. At least the ones I haven’t burned. It’s typically how I’ve worked through things in my life; pen to page. But lately, I’ve felt quiet. The missing her comes in waves and sometimes leaves me gasping for breath, and all that’s left is to draw air. My words fail me. Other days I seem to be on auto-pilot. Get up. Brush teeth. Make coffee. You get the point. I kind of just “exist” completing the necessary tasks. But sometimes I am slayed with such beauty that my heart cracks open and can feel, really feel, something good again. Hope maybe, expectation. And then, as quick as it came, it recedes back and is again replaced by the fog that is grief. I need to write each day. Even if only a word, just one word. It will be movement. It will mean something. Like rungs on a ladder for climbing out of grief. Each word a rung. “The secret counsel of the Lord is for those who fear Him, and He reveals His covenant to them. My eyes are always on the Lord, for He will pull my feet out of the net. Days when the wind rolls in fierce, and leaves twirl sideways carried on air, and huge gusts knock you back; this is what grief feels like. You know how hard winds blow against you on those days, making every step laborious..yes, that feeling. It’s not that she’s always at the forefront of my thoughts, though often she is. It’s more that some invisible heavy blanket has been laid over my every thought and action. Every other feeling is tempered by loss in some deep recess of my heart. I can laugh, yes. I find such joy in my boys, and am even a little lost when away from them, without them there is no one to mother and I find that I need that most of all. For so long, my attention was zeroed in on Phoebe’s many needs, and life is too simple now without a round-the-clock med schedule and shots and water pumps to be turned on. I have a restless energy that begs for a task, coupled with the inability to focus on any one thing or give my full attention to it. It’s much like going in circles or walking into a room several times a day only to forget what you came looking for. But sometimes I’m brave. Sometimes I go into her room when the boys have gone to bed. And if I’m really brave I look at her monkey slippers that still have leaves stuck to them from the last time she wore them. I look through her drawers and hold her clothes, and I see those socks still in her laundry basket that she wore the night she died. And her pajama top, with the pink strawberries, I remember slipping her sweet little arms out of it after she’d gone. It still hangs on her closet door-knob. I hate these times. But it feels necessary. And then, at least for a little while, I can go on about life. I am so proud of our boys. I feel like they are doing well and doing what they’re supposed to. We talk about Phoebe all the time, we wonder what she’s doing today, or Deacon supposes that she’s probably taking a bubble bath (one of her favorite things) or eating peanuts. We share memories or “Phoebe-isms” and we laugh together. They ask good questions about God and we talk. And some days one or the other seems a little down, more quiet than usual, needing extra space to just feel. We are easy in the mornings, rather than sticking to our usual “alarm-clock wake up for school” routine. We drink hot cocoa and I read to the boys before we start our schoolwork. We take breaks, I cry randomly, and then we move to the next subject. So, it ebbs and flows and some days are more productive than others. We are trying to be gentle with ourselves and with each other, which isn’t always easy. It would be nice if there were a set “end date” to grief, but I don’t think it works that way. So for now, we take it one day at a time. God is near, and grace is real. We feel very cared for by the Father, even in the midst of our sadness. And then surrender to the inevitable.. But then the crushing wave transforms into a gently falling snow. .what to make of that? 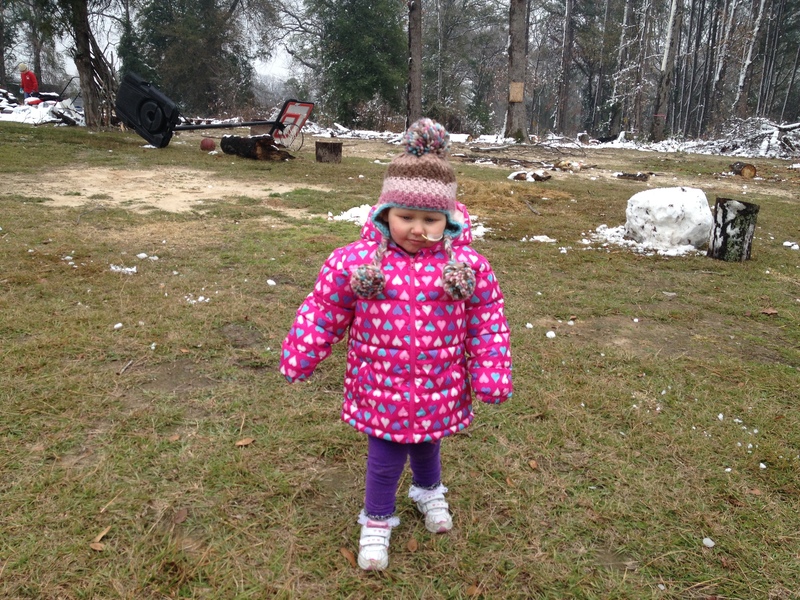 When it came time to make plans for Phoebe’s Make-A-Wish trip, she asked for snow. A few months later, a miracle took place. Big, fat, snowflakes suddenly fell from the sky on gusty winds. We were shocked. Phoebe sat in our bay window seat and clapped her hands in delight as the giant flakes made a white blanket across our yard. We marveled. It felt like a personal gift for Phoebe, straight from God. The snowstorm was so powerful it knocked out our electricity and we spent the evening warming our hands by the woodstove and playing board-games by candlelight. It was magical. 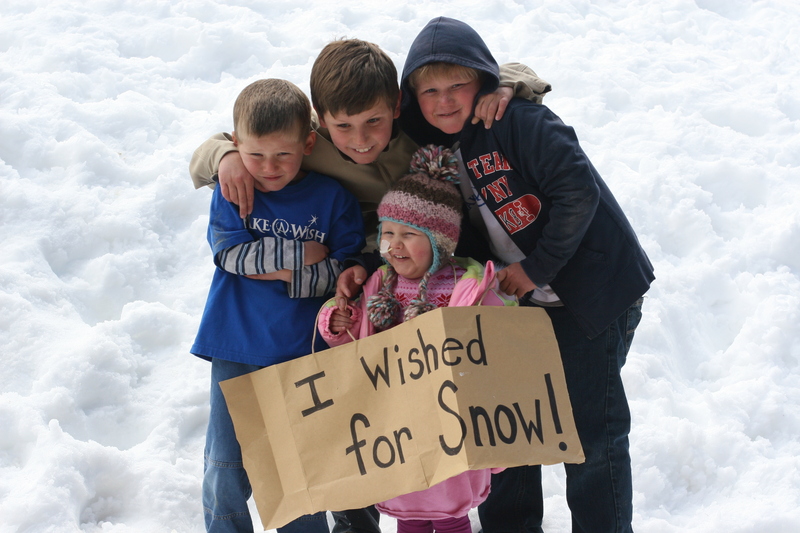 A month after Phoebe completed chemotherapy, Make-A-Wish flew us to Colorado to get Phoebe some BIG snow. We spent a week in a beautiful cabin surrounded by snow covered mountains. Phoebe and Deacon made snow-castles while the big boys went sledding, and we spent our evenings drinking hot cocoa and putting jig-saw puzzles together. I remember the quiet of the snow. It was packed all around us, several feet high and it made everything still and peaceful. A nice way to spend a week after 14 months of hospitals and surgery and sepsis and chemo and seizures and loss and tears. A gently falling snow after the tsunami….